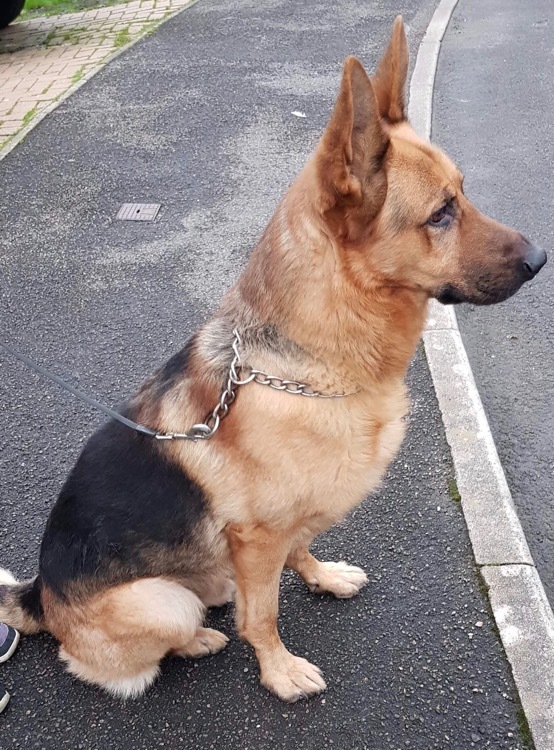 This handsome chap is Bear, a 6 year old entire male GSD looking for a new home due to a change in his owner’s circumstances. Bear is a devoted member of the family and has lived with his owner since he was a pup. He is very bonded with his family and because of this he can feel the need to protect them. He will need a German shepherd experienced home that is able to work with him to manage his guarding behaviour. He is fine as long as people do not try to approach “his person” and needs separating from visitors entering the home. Due to this any new family will need to meet him several times before taking him as he needs to get to know them first, please keep this in mind when offering him a home. Bear has never lived with another dog but did attend training classes where he enjoyed company. He may be able to share his home with others pending a successful meet although he is possibly best suited to sharing with females rather than males. He does currently live with a cat and should be able to again. Due to his nature he is looking for a quiet adult only home. He has good recall and is happy to travel in the car. He is used to being left and has no issue with it. Bear will give back the love he receives ten fold but needs someone who can help him understand that he doesn’t need to look after them. Could you be the one for him?